I’ve been messing around with it for a bit playing with the rules (which they call Aggiornings). While at PDC a few others from the team were there showing what they can provide for IE8 developers. I took the opportunity to give feedback on my experience to Gilbert and his team. Hopefully some of my suggestions can be looked at to add even more value. For now, two features helped me greatly. 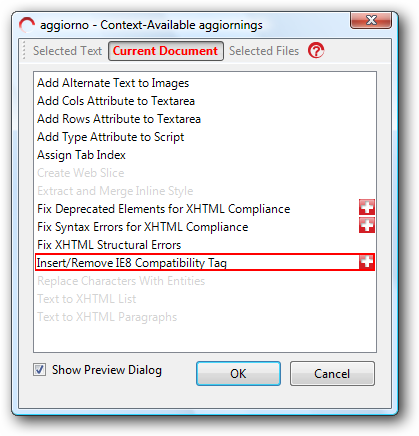 Notice how they have a simple rule to help you add the IE8 meta tag based on your needs to your content. I used the XHTML rules and was surprised that my site passed most of them :-). It provides a really good “diff” report of your content as it applies to the XHTML standards and how you can change certain things. I used the Create Web Slice option which generated the markup I needed to add to my site. It was quick. Sure the markup itself is relatively easy from IE8, but this makes it easier and you don’t have to think. Two clicks and I have a web slice – no typing :-). Check it out if you are viewing my site in IE8, you should be able to either hover over the first post or notice the Web Slice icon light up on the toolbar of IE8 as well. Adding it will add my site as a slice and when a new post comes in, it will alert you subtly (changes to bold). You see a partial post (slice) and can click through to the main page. I’m liking this feature of IE8 and hope to see more sites do this. The web slice feature was one where I gave some feedback to the Aggiorno team in addition to enhanced support for sites that use templates (like blog engines). Their team “gets it” which is good and they have some smart folks on the team. Anyway, it was good to see Gilbert again at PDC and get a chance to work more with the product hands-on. Check it out and view some quick start information on their site.